I really must be finally becoming SEC, because I’m actually really excited for the season to start. Go ahead and start the jokes about our high school stadium and team. I don’t care. I think we will have a pretty good season, just not ready to compete with SEC baseball yet. You call this a "stadium"? Field then. I don’t GAF. Let’s play ball! Everybody is 0-0 and hope springs eternal for Friday. You all have a chance at being #2. Welcome aboard the LSU bandwagon. What sort of team are y'all expecting to field this year Mizzou? I've always said that Mizzou will benefit the most from being in the SEC in baseball and softball because y'all are a baseball and softball crazy state. You're facilities will continue to get better for both, your talent level will continue to go up ... and you've already got some good baseball history. The SEC East is a beast but the entire conference is tough. When fans from around the country ask me if SEC football is the toughest sport in the conference or women's basketball the toughest top to bottom to compete in ... I always say the real gauntlet is playing SEC baseball. You never get an off week. You never get a chance to blink. Every week it's solid staffs in great venues with outstanding crowds (most of the time anyways). In the East you've got three programs that have won National Championships this decade, five total that have won National Championships. In the West you've got LSU as the 300 pd gorilla and a very respectable Miss State, Ole Miss, A&M and Arkansas. The conference is really just crazy elite top to bottom and it's only getting tougher every year. Man, I figured they would be a good addition in softball as well, but their team certainly fell apart since joining the conference. Had s streak of three straight years going to the WCWS (2009-2011) snapped the last season before joining the SEC by a future conference opponent (LSU), and have struggled making it to the Supers since then. Granted, it seems they had some sort of turmoil with the previous coach, and now have the whole NCAA sanctions going against them. It's unfortunate because it was another solid team in a conference that's becoming the best of the best. Also...why did softball get lumped in with those sanctions? Baseball did too, right? I never did read the whole story on that. I’m excited about this team. We get Kameron Misner back, who missed most of last year. Probably our best hitter and preseason all American. I like some of the young arms coming in. Lost one to the draft, but 3 or 4 others opted not to sign. The talent is getting better, but just not up to SEC standards yet. Baseball and softball. Both are banned from post season this year. I really must be finally becoming SEC, because I’m actually really excited for the season to start. Welcome to it. Baseball is the most fun to follow and the purest college sport of the big 3. Make sure your local sports radio stations cover it correctly. 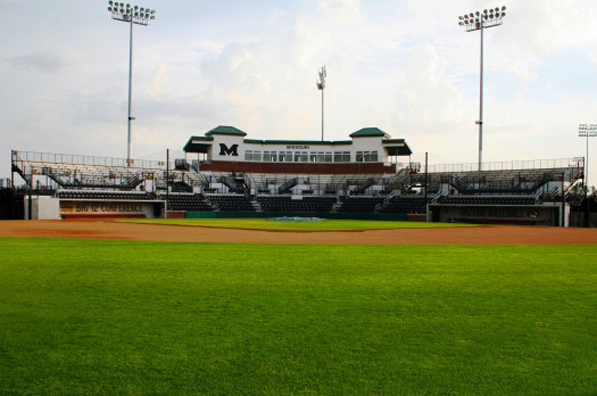 Our softball stadium is nicer then that higschool stadium. Anyway, glad to see a Mizzou fan getting excited about college baseball.